This evening I made one of my favorite things for dinner...Pan Seared Copper River Salmon. I took 5 fillets out of the freezer before going to bed last night and placed them in the fridge. Three of my pieces were Coho and the two larger pieces were Sockeye. I spent extra time wrapping them before freezing them last year and after wrapping them I placed them in freezer Ziploc bags and removed almost all of the air. They looked just the same as the day I froze them and not a speck of freezer burn or ice crystals. I kept it super simple. 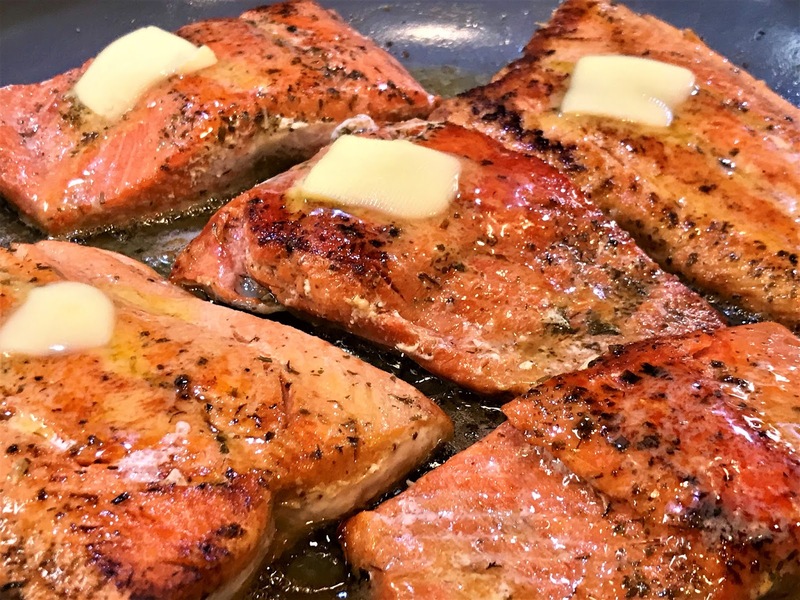 I had about 1/2 of a stick left of Kerrygold's Garlic & Herb Butter and used that to cook the salmon with in my large 12" nonstick GreenPan that has a glass lid which I really like because you can keep an eye on what's going on in the pan without opening it. It only took about 10 to 12 minutes to cook (it was still very slightly frozen/icy). I only used 3 ingredients; salmon, butter and pink sea salt. The salmon takes on a beautiful color as it begins its cooking flesh side down; the butter begins to brown and gives it a gorgeous color. To go with our salmon, I decided to make a small batch of homemade tartar sauce (it's one of hubby's favorites). I typically don't use tartar sauce with salmon because I want to taste the salmon, but I must say...I added about 2 tablespoons to my plate and it was absolutely delicious with the salmon and did not take away from it at all. Hubby thoroughly enjoyed it. I keep Bubbies Dill Pickles, Bread & Butter Pickles and their Sauerkraut in my fridge at all times. Hubby had a piece of the Coho and I had a piece of the Coho and a small piece of the Sockeye so I could try them side by side. The Coho was slightly more mild than the Sockeye but both were delicious. 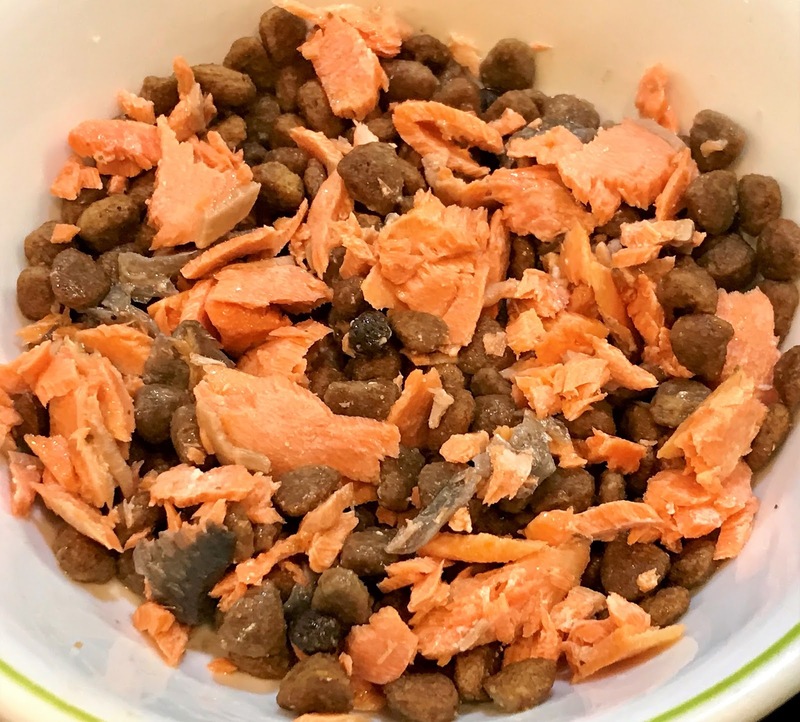 Spike enjoyed a large chunk of the Sockeye broken up and mixed in with his grain free dog food; he absolutely LOVES Copper River Salmon! We usually add chopped boiled chicken breast to his food (Blue Buffalo's Freedom Grain Free) but he was so excited to find salmon in his bowl tonight instead. 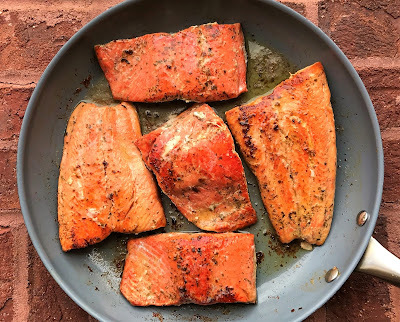 I've added a few photos of both our salmon and Spike's salmon dinner below as well as included the super easy peasy recipe for both the Pan Seared Salmon and the Bubbies Tartar Sauce. Enjoy! To prepare salmon: Heat a large nonstick skillet (or cast iron, if preferred) over medium-high heat. Add 4 tablespoons butter to skillet. When butter begins to sizzle, swirl the skillet around to evenly coat the bottom. Place salmon fillets flesh side down and cook partially covered for 4 to 6 minutes, depending on thickness (add a couple minutes if partially frozen). When salmon begins to brown, flip fillets over and continue cooking covered over low-medium heat for an additional 4 to 6 minutes (you may need to reduce heat to low if butter begins browning too quickly). During the last couple minutes of cooking, top each fillet with a small pat of butter and season to taste with salt. Salmon is done when it flakes or separates when pressed. If desired, serve with tartar sauce on the side (recipe below). To prepare tartar sauce: Combine all tartar sauce ingredients in a small bowl. Taste and adjust to your own taste. 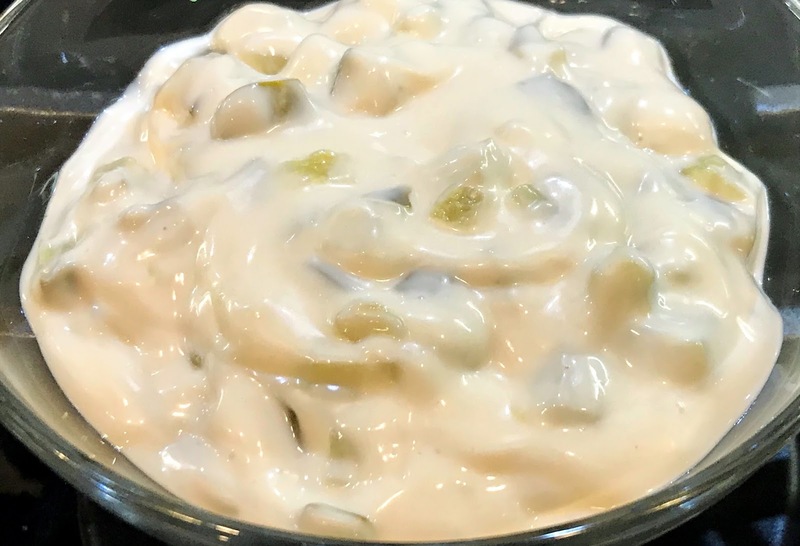 Tartar sauce is best if made ahead of time and allowed to sit in the refrigerator for an hour or more to allow flavors to blend. It's that time of year again, isn't it! Thanks for the reminder. Your dinner looks fabulous -- and so does Spike's. Hi CyberSis. I’m just now seeing your post. Don’t know how I missed it! Today I was so excited to find wild ALASKA salmon at Costco. It’s not labeled as Copper River so I believe it’s from Prince William Sound. Apparently The CR salmon supply is late this year. Hopefully it will catch up. I’m still excited about finding this today. Looking forward to dinner tonight. It’s Saturday June 23rd FYI. 😀 Hope you and your Frittata King are doing well. Have you found CR salmon yet this year?